Induction Disbonding is the latest system for the clean, economical, rapid and safe removal of coatings from steel surfaces. Based on the principles of induction heating, the technology works by generating heat below the coating of a conductive material like steel. This results in quick and clean disbonding which has many benefits over traditional methods used for coating removal such as grit blasting or ultra high power water jetting. Induction Disbonding equipment is quiet to use, with no dangerous high pressure hose required. No airborne waste particles are produced that are dangerous to the environment or operators. The process eliminates need for grit used in more traditional blasting techniques, and the associated disposal of waste grit material. Induction range of different paints and coatings can be removed from most standard paints; hard coatings such as epoxies and urethanes; bitumen and other asphalt linings to glass fibre linings and chlorinated rubber. New coatings can often be applied directly over treated surfaces. 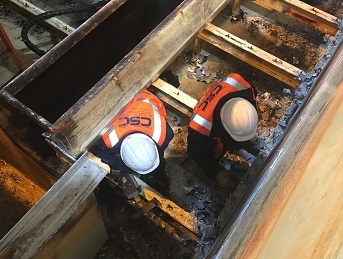 In 2017 CSC Services used the process of induction disbonding to remove failed coatings and rust from a United Utilities filter tank. Traditionally the process of grit blasting would be used for such a task. For a job of this size over 40 tonne of grit would have been used and disposed of. Induction disbonding is used across other industries and has a host of benefits. It is more economical, more environmentally friendly, clean, safe, silent and most importantly in this particular case limited disruption to other operations. It has significant scope for use in refurbishment programmes across the water and power industry.